I’m not a morning person, so competitions in Japan are always a challenge for me. But this challenge was accepted. This season GP series is too unpredictable, too many surprises and shocking news. GP what are you doing …..stop. Because I’m already terrified to watch next events. Before we start I want to ask what happened to Japanese cameraman and video director? They always so good in showing figure skating! This time there too much creative and unexpected angles, I still feel dizzy. Please, don’t show Final like this. I was so excited about NHK when the entries lists just appeared….but we all know what happened next. So actually I don’t have much to say about NHK) Yeah personal drama…. I like the Austrian pair, they don’t claim for medals, but pleasant to watch. Especially, I like the song from the short program. Every time I hear it I want to sing. What a sad news for my neighbours. Alexa Scimeca is an incredible beauty! She looks gorgeous, she has so much elegance on the ice…..But Chris don’t like jumps…Which is too unfortunate. Chris please don’t let you beautiful wife down. Something doesn’t work for Canadians Julianne and Charlie this season. I thought they’re solid contenders for the spot in Canadian Olympic team, but now I’m not that sure. I like their short program a lot, it’s so well choreographed! So I feel a bit sorry, but I’d gladly give that program to someone else. By the way is it a Canadian thing or what? Why Charlie looks like Scott Moir before haircut…..or like their prime-minister? With each competitions Astakhova – Rogonov prove their intentions to get that third spot to Olympics. And I root for them, I like how they improved this season. I think they’re the only ones whose La La Land doesn’t look like a disaster. But watching them skating that FP I have one desire – to wash up Kristina’s lipstick with his tie so we could get rid of both this things. Ksenia and Fedor are damn chic in their short program! The free program still doesn’t work for me. I mean, the elements are great, the music is strong and powerful and suits them….but there’s no story, no connection between them…It worked perfectly for their modern programs, but Carmen it’s quite a different thing, it requires some interest, some fire between partners. Probably they’ll add it, maybe they’re just too concentrated on elements. And of course they need to fix the twist, they loose a lot on it. Sui and Han. Is it possible to learn how to feel your partner like this? Is it possible to learn how to skate like this? And you know, the answer is yes. It’s definitely possible. Just look at them back in juniors and you’ll see what a tremendous work has been done! So everything is possible. 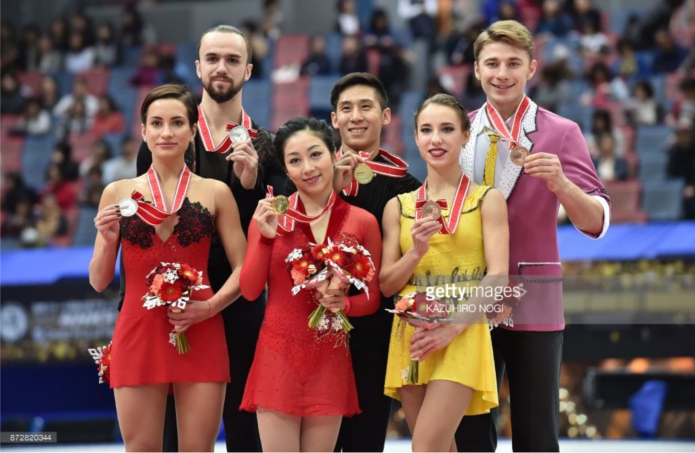 Their Hallelujah is quite an emotional piece for me, but in Japan it was twice emotional… For me in Japan, they were skating it for themselves and for that guy. I liked their fp this time, but still I think they could have done something more special, Turandot is quite a safe choice for such not ordinary pair. Strange thing, with all her lack of nice lines and bad posture I really found Rika Hongo entertaining to watch. She has this spark that helps her to stand out among many sweet but not really memorable Japanese girls. When no one expected Aliona Leonova delivered the skate of her life. She’s in good shape, she has nice programs and best dresses in her career. 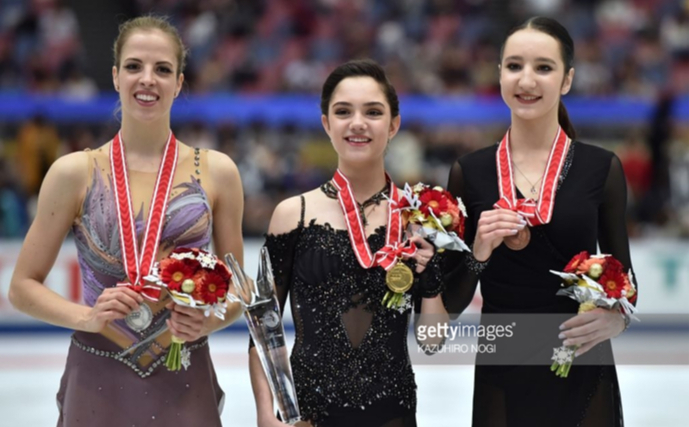 In many other countries she would compete at Europeans and Worlds…unfortunately not in Russia( But she got good scores that probably will help her to get GP next season….So if she wants to continue, why not. Go for it, Aliona! It was so nice to see Satoko skating again! She’s such a lovely skater, with beautiful lines, choreo, her programs are great, but jumps are not there( That’s sad and probably means that we won’t see her at Olympics. She needs a miracle for that to happened. First I wanted to write many things about bad judges who terribly underscored Polina, but then I decided not to make figure skating goods angry. It’s happiness that she’s skating after all her injuries and health problems. It’s a great debut and if she continues to skate clean her PCS will grow. As a Game of thrones fan I’m grateful that they took this music for the SP, but I don’t like the interpretation. Too much pantomime. The free program doesn’t show even a third part of what she’s capable of. Maybe it’s better to bring back her last season’s program and update it for senior level. Probably for the first time in her career I was worrying about Evgenia. Her skating wasn’t excellent like we used too. Maybe it’s ok, it’s not time to pick. But I watch her skating and realize that it becomes harder and harder for her…And her FP…black dress, the drama of Anna Karenina and that sounds of train…you just know that something will happen…she fell and this time it wasn’t unexpectedly. But the ability to focus, to make the necessary changes in her content is amazing. Her nerves are made of steel and that’s her biggest advantage. What to say about men’s event? That was the most unexpected podium of the season! But I really happy for each of them! They got a chance and they used it. In Canada I really thought that things has changed for Michal. Unfortunately that was a rare coincidence, in Japan we saw typical Brezina fighting with quad salchow and other jumps. I love Jason Brown‘s short program! It’s amazing and so entertaining. This is the advantage of something new for figure skating. Every time you see this program you get excited and you don’t compare it with for example the rest of 27 Moulin Rouges (yes, some kind people conted). I loved his fere program when I saw it at some b-event. He was wearing that simple black costume, he looked so elegant his moves was so graceful….and the program was skated clean. Yes, clean skating is very important for such style, otherwise it doesn’t make an impression. Oh and blue pajamas just ruins the elegance (even though his pants were darker this time). 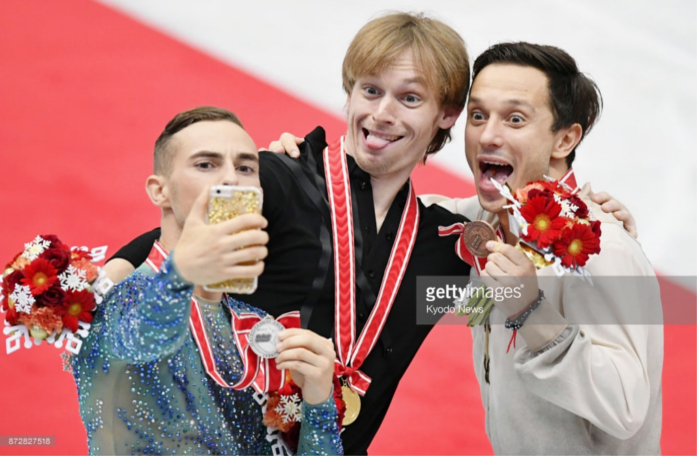 That was an unpleasant surprise from Jason, I mean after Patrick and Yuzuru withdrew, one of those medals (maybe even gold) was his to take….and that didn’t happen. First of all I need to say that Adam‘s new costume is fabulous! So beautiful! And his skating was also beautiful and so sincere. Loved it. He created such an emotional moment and I was happy for him. So great it happened on his Birthday, great present, I think. But this short…..I just think he’s capable of much more and this below his abilities. Probably Sergei reads my blog so he knew that simple black costume is the best solution! Too bad he didn’t read what I think of such costumes that he has for the short program. #Burn. His program look a bit old-fashioned, but they suit him and his style of skating. The jumps was there….He hasn’t been skating like this for a while. Actually it’s the first GP he won….and he’s 30. What an irony for modern figure skating. But that was cool and as I said I really happy for all the medalists! Well done guys! I understand that Penny and Nicholas haven’t been preparing for this event, they might have their own training plan and they had to change it to go to the GP last minute. Probably this affected their skating, the quality of elements. Well, it’s hard to judge. I like Nazarova and Nikitin, they’re lovely pair, young and creative. But they still look like “just from juniors”, they lack some style and elegance. And I don’t think Igor can give them that. Laurence Fournier Beaudry and Nikolaj Sorensen have one of my favorite free dances of the season. So when I watch it I just pray please don’t fail the twizzles, please don’t spoil the impression of this beautiful dance. He didn’t this time) And I feel they was underscored a bit, I think the fact that they’re not going to Olympics has something to do with that. I think Zhulin wanted to give Sinitsina – Katsalapov something different from usual latina and songs we know by heart thanks to seasons of latina. But I don’t think it really works for Vika and Nikita. The dance make them look colder, with less temper…Well maybe that was intentional, because when Nikita gets emotionally involved into music he loses concentration (just like in the free dance). As for the free dance, I like the idea to give Rachmaninov music to a Russian duo, because this music has everything that Russian dancers are good at – emotions, passion, drama, powerful skating. I think this dance has a potential. But costumes need to be gone…..
Back into the season 2011-2012 Anna and Luca had really good latina. It was lovely, it was nice and dancing. So I expected them to be that good again and unfortunately that didn’t happened. Luca was great by the way, but Anna…..you can’t skate latina with such stiff back…Their free dance was very emotional. Despite the fact that it’s a horribly sad story their dance leaves slight feeling of sadness, not drama-drama and I loved that. The dance is completely in their style and that’s right, because that’s why we love them. Hubbell and Donohue….oh gosh….I just love them. Is it even necessary to add something?) I just wish she change the dress for the short dance…. 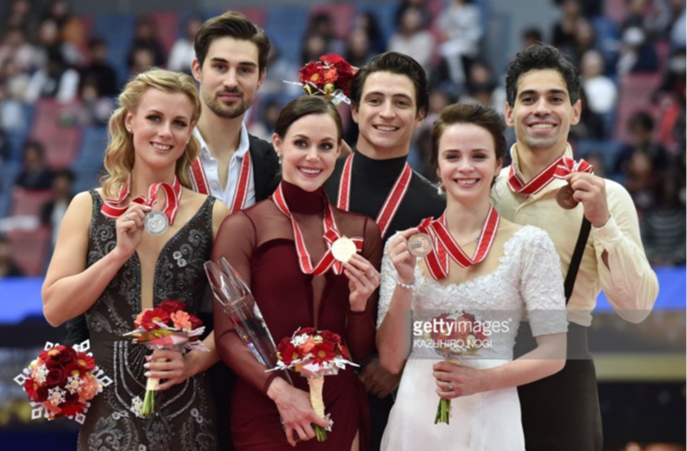 I said that many times but I will say again – no one skates like Tessa and Scott. In Japan, I realized that I’m actually so glad they didn’t take something in this trendy style of lyrical psychose (because I’m already sick of it) and took something they really good at. Because I’m sure you can’t win by copying someone, Copy is always worse than original. They show us a story of man and woman, a story of mature relationships….Bright, dramatic, exciting. And no one will tell this story like they do. The main thing is to skate cleanly and come what may….but I’ll hope for the best. I agree that Astakhova-Rogonov have very nice La La Land program I wish them that third sport to the Olympics. As much as I love Ksenia and Fedor, I’m a little bit disappointed with their FP. I like it, it’s very nice to watch, I like the music cut, but considering their previous choices of music it’s just too ordinary for them. I’m sad for Michal too, I thought that after Canada things are going to look up for him, but unfortunately not. I completely agree about Rika, she has her own style and is entertaining to watch. She and Wakaba stand out from sweet but not memorable Japanese girls.I absolutely love Wakaba’s FP. Adam’s performance was just gorgeous, it was emotional, beautiful, sincere. Everything was there. Although I admire guys capable of all those quads, when I see a performance like Adam’s I think- quads-who cares? “Things aren’t get better for Alaine Chartrand.” No, they are not. I’m worried about her.